Why Is Every Chinese Tech Company Doing Online Finance? When it comes to China’s internet giants, there’s barely a player that hasn’t entered the world of online financing. Following in the footsteps of Alibaba, many of these companies are looking to finance as a means of subsidizing heavy cash burn rates in their core businesses. Ant Financial, which oversees Alipay, the country’s largest mobile payment service, is the financial affiliate of internet powerhouse Alibaba. Following their rebranding in 2014, Ant Financial has expanded to become a full-fledged financial services company, with a range of services and high-level cross-border finance related investments. JD.com, a leading online Chinese retailer, began providing short-term credit to its suppliers in 2012 and later to third-party sellers on its online retail platform. JD Finance, established in 2013, now provides products and services in supply chain finance, consumer credit, wealth management, crowdfunding, digital payment, and insurance as of late 2015, according to the company. Social network giant Tencent has been working on funneling users from their highly popular social networks, WeChat and Mobile QQ, to Licaitong, an online financial products marketplace launched in early 2014. WeBank, the online-only private bank jointly established by Tencent, has launched a handful of online banking and financial services since its opening in early 2015. Not to be left out, smartphone startup giant Xiaomi unveiled MiFinance in May 2015, a mobile app that sells financial services to Xiaomi users. Sina, the leading online news portal and parent company of social media service Weibo, search giant Baidu, and Qihoo 360 have also tapped into the sector with some me-too offerings. Renren, the notorious Facebook clone, has even shifted their entire business model to focus to internet-based finance following the slow decline of their social business. Mid-sized Chinese tech companies, especially online marketplace operators, have also begun providing loans to merchants on their platforms, offering consumer credit options as well as selling traditional financial services. These companies include classified platform 58.com and market-leading online travel services Ctrip, Qunar.com, and Tuniu.com. 58.com provides short-term loans and installment options, not only to merchant customers who post classified ads, but also to users who wish to to purchase cars and real estate. Ctrip and Qunar, the two leading online travel services who merged in 2015, announced an online insurance products platform last month. Alibaba’s Ant Financial is reportedly valued at more than US$50 billion in an ongoing fundraising round. Alibaba began making loans to merchants on their Taobao marketplace in 2010. Today, Ant Financial has Alipay, micro-loans service MyBank, online consumer credit portal Ant Check Later, credit scoring tool Sesame Credit, money market fund Yu’e Bao, online investment marketplace Zhao Cai Bao, personal finance management platform Ant Fortune, online equity crowdfunding platform ANTSDAQ and Ant Financial Cloud service. Yu’e Bao became one of the largest money-market funds in China immediately after its launch in mid-2013. 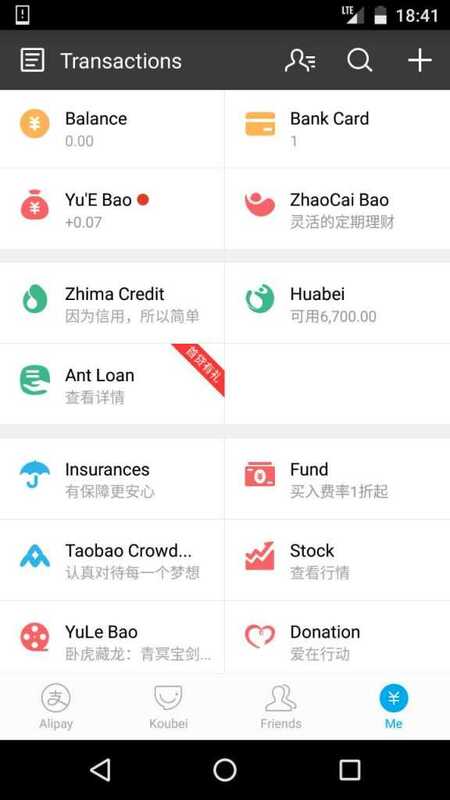 Within one year over 100 million users purchased RMB 574.1 billion (US$92 billion) worth of Ye’E Bao funds. At the same time MyBank had had some 800,000 small business customers and made RMB45 billion ($7 billion USD) in loans within eight months since launch in mid-2015, according to the company. Alibaba Group and Ant Financial together have a host of advantages in the online finance market which has helped them to slay early competitors and wipe out mid-size competitors. Alibaba’s big data capabilities offer a wealth of historical data on merchants and consumers which has helped them moderate credit risk, they also had a huge customer base ripe for conversion at the time of the launch as well as efficient and scalable online infrastructure. Ant Financial has targeted two core demographics in China: small businesses that have long had difficulties getting loans from banks, and the large percentage of Chinese consumers who have never owned a credit card or purchased any financial products. A Higher Margin Business For Tech Companies, (Especially The Financially Struggling Ones). Liu Qiangdong (aka. Richard Liu), founder and CEO of JD.com, said in March 2014 that they expected some 70% of the company’s net profit to be from their financial offerings ten years from then, although the online retailer still wasn’t turning a profit at the time. JD.com recorded US$29 million in operating losses for 2015 even though its gross merchandize volume and revenues reached US$69 billion and US$29 billion respectively. In the tech industry it’s not unusual to see startups losing money despite having a large user base and a high value. The country’s highly competitive tech sector strongly prioritizes market share acquisition, oftentimes resulting in a severe cash burn. JD.com, 58.com, Qunar and Tuniu are all online marketplace operators, each with hundreds of millions of users and a large business customer base. They make revenue through online marketing and advertising, merchant-facing premium subscriptions and a few other minor sources. All of them were still losing money as of the end of 2015. To them the Ant Financial model appears to be a perfect way to monetize quickly in a tight market, one that may have a much higher profit margins than their respective core businesses. The step form online transactions to financial products is relatively minimal, especially if they have large amounts of customer data at hand. There’s no definitive timeline as to when these companies will be able to turn a profit through online finance, but their financial arms are receiving massive private valuations. JD Finance announced a RMB6.65 billion ($1 billion USD) financing round at a valuation of RMB46.65 billion (roughly $7.1 billion USD) this January. Investors include Sequoia Capital China, China Harvest Investments and China Taiping Insurance.